Like most auto manufacturers, Toyota is big in the crossover scene. The RAV4 and Highlander are ubiquitous in shopping mall parking lots and elementary school pickup lines, even more than the Camry these days. They may look tough, but they’re very much tall cars, not the trucks that SUVs evolved from. I used to call my ex’s Highlander her jacked up Camry. (Maybe that’s why she’s an ex now.) But Toyota still offers a true truck-based model that goes all the way back to 1984 - the 4Runner. 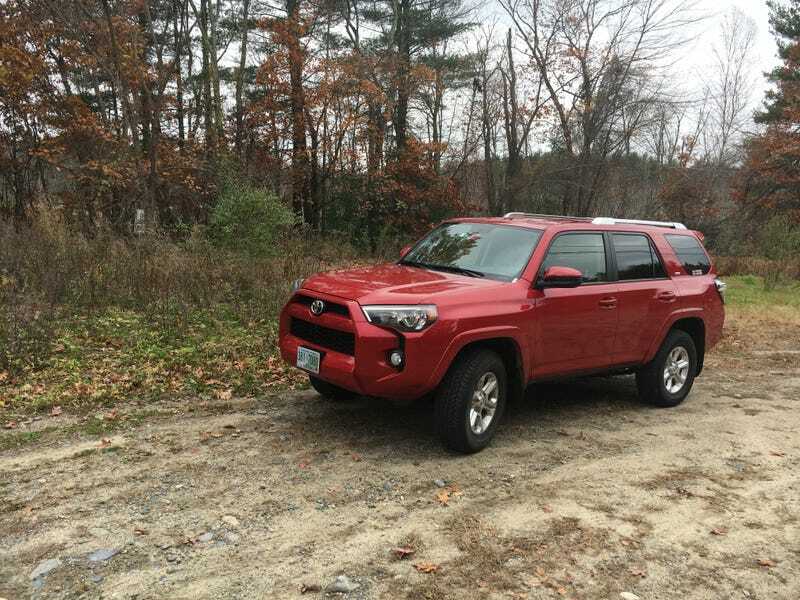 Though not one of Toyota’s more popular SUVs, the 4Runner still exists for people who actually need an SUV of the classic body-on-frame, part-time four wheel drive with low range variety. It’s more similar to a Tacoma than a Camry. Though my wife likes her Flex, she’s more of a truck girl at heart, and the 4Runner was high on her list of possibilities when she was shopping. So we enjoyed playing a game of “what-if” and living with the 4Runner for a couple of weeks. Beyond that, we had volunteered to drive sweep at the Empire State Performance Rally, and though the Flex could have done it, we were happy to find a vehicle even better suited for the job. The 4Runner looks like yet another bloated SUV. But its styling is a bit tougher and more aggressive than Toyota’s other models, appropriate to its tougher nature. The fenders bulge out as though they’re begging you to install some proper all-terrain tires under them. The creases between the headlights and fog lights look a bit awkward to me, but that’s modern styling for you. The roof rack sits a bit too close to the roof for me. This seems a weird complaint, but I make it because I was unable to run the wiring for my ham radio antenna and amber warning light underneath the rail because it was too close to the roof. It’s a minor and rather unique criticism, but one I’ll make anyway. I was quite pleased to see that our SR5 rental came with a full towing package. We didn’t plan to pull any trailers, but we attached our own tow hook to the receiver to drag damaged cars around at the rally, rather than risk messing with the one in the back and two in the front of the 4Runner. They’re nice and beefy, so I was more concerned with scratched paint than any actual damage. The seats were cloth, and not heated. Again, this was a low grade rental special. They were firm, but reasonably comfortable and fairly supportive. I wouldn’t call them cushy, but I felt okay after a few challenging days in the driver’s seat, though I admit I was glad to return to the relative comfort of my BRZ afterward. Yes, I know a Subaru BRZ is not exactly the lap of luxury, either. The center console looked like it belonged in a Little Tykes My First Truck playset. All of the knobs and buttons are huge, plastic, and kind of cheap looking. These are in keeping with the 4Runner’s image as a tough truck, but they didn’t appeal to me too much. On the plus side, kudos to Toyota for giving us good old fashioned buttons for all basic infotainment functions, especially a tuning knob, instead of relying on the touchscreen to manage everything as most modern vehicles do. The 4WD control was a knob positioned awkwardly in front of the floor mounted shifter, which I had to reach around to access. It worked just fine, but I can’t help reminiscing about the good old fashioned lever on the floor of the XJ Cherokee I learned to drive in, or the Project MJ Comanche I’d hoped to be using for rally sweep. Older 4Runners had a lever, but the 4WD controls are all electronic now, and I suppose a big chunky lever takes up space that could be filled with an extra cupholder instead. It’s not a control that most drivers fiddle with a lot, but I was constantly switching to 4H for rally stages, 2H when returning to pavement, and 4L for occasionally towing disabled rally cars. Again, blame my unique situation for this complaint. Most people won’t use this function as often as I did. You must have the transmission in neutral when switching the transfer case from 4H to 4L. You can set the controls any way you want in any gear, but the dashboard will beep and flash at you and not make the change unless you’re in neutral. This is fairly standard for any part time 4WD system. I was quite happy to have low range available for dragging a broken rally car out of the road, which the 4Runner did with no problem once we weren’t trying to drag it uphill. We were limited by gravity and traction in that situation, not the truck. I know I sound like a broken record, but on the road the 4Runner drives like a truck. You feel all of the bumps through the stiff suspension. I missed the smooth ride of the Flex on the four hour drive between home and ESPR. It’s fine for driving around town. It’s big, but the standard backup camera helps you avoid running over Miatas behind you without noticing, which could totally happen. It handled my wife’s errands and school runs fine, just not as comfortably as the Flex. Part of that is because the Flex has the high end Limited trim package and is not a fair comparison to the low end SR5, but part of that is also because the 4Runner is a truck, and it never lets you forget that. It was certainly not the most comfortable vehicle I’ve ever taken on a four hour highway trip. The headlights are fine in the dry, but were quite lacking in the rain on the way home from New York, making it difficult for me to find lane markings at times. We’ve been extremely spoiled by the 3.5 liter EcoBoost V6 in the Flex. The 4Runner’s naturally aspirated 4.0 V6 didn’t seem impressive in comparison, but it’s a good engine that did everything we asked of it. I never needed any more power than it had to offer, though occasionally I wanted a little more (but what enthusiast doesn’t?) It’s a good engine that did its job well. When the transmission is in D, a fuel economy display appears on the gauge cluster, enticing you to drive conservatively enough to turn on the green ECO light. If you use more than around 10% throttle, the light turns off and the display flashes at you. I found it rather annoying, and did not find a way to turn it off. If I wanted an electronic fuel economy meter I’d drive a Prius, not a 4Runner. Fortunately, if you move the shifter into S, the 4Runner correctly assumes that you don’t give a crap about fuel economy, and that display goes away. Though it seems like you can shift gears manually by pushing the shifter forward and back, what you’re actually doing is specifying the highest gear it will go into, as though there was a 4, 3, 2, 1 on the shifter. Although I would hesitate to call S a “sport mode,” it definitely favors power over fuel economy, and locks out fifth gear by default. You can “upshift” to enable fifth while keeping the more aggressive shift pattern, which is exactly what I did on the twisty hilly 55mph back roads between rally stages at ESPR. D was fine at all other times on the road, as long as I was willing to put up with the fuel economy meter. When we left the pavement, the 4Runner suddenly made a lot more sense. It was okay in 2H, but I engaged 4H once the wheels hit dirt, because I could. I put the transmission in S, and it always seemed to hit the right gear, allowing me to keep my attention on following what passed for a road rather than what gear to be in. I turned off traction and stability control for most stages, but the 4Runner never put a wheel wrong. I may have tried to induce a small power slide occasionally when making sharp turns by spectator areas, but the 4Runner just accelerated out of those turns with no trouble whatsoever. The only way I’d be able to wag the tail would be to turn off four wheel drive, which I wasn’t about to do. ESPR is known for its rough stages, but the 4Runner handled everything we could throw at it - and we threw a lot at it. Rally officials limited us to a top speed of 40mph, but considering that these roads normally have a 15mph limit we asked a lot of the 4Runner, and it delivered every single time - even when dragging a crashed Subaru with two locked wheels off the road. The Flex would not have fared nearly as well in these conditions, having lower ground clearance and being a large crossover rather than a truck. The sky opened and dumped heavy rain on the last few stages of the rally. I cranked the front and rear wipers as fast as they would go, which was necessary for me to see anything through the windshield when we hit freshly formed puddles of reddish-brown water and mud. I left traction control on for these stages as an extra safety margin, but the 4Runner was so sure footed that the electronic nannies never kicked in. This was far more extreme than the snow Will and Mike drove through on their way to NAIAS. Now I completely understand Mike’s raving about how well their 4Runner worked for them on that trip. I also understand the similarities he saw between the new 4Runner and his 20 year old Previa. Despite the touch screen and buttons on the steering wheel, the 4Runner does not have many of the amenities most people would expect of a $35,000 SUV. I completely understand why the average driver would pass up the 4Runner for a comparably priced and better equipped Highlander. For the street, the Highlander is absolutely the better choice for comfort and amenities. But I’d break a Highlander if I put one through what the 4Runner soaked up with no trouble whatsoever. The 4Runner hasn’t evolved nearly as much as the Highlander has, and that’s OK. The crocodile hasn’t evolved much in the past 55 million years either, yet is much better adapted for its habitat than humans are. Why fix what ain’t broke? Similarly, the 4Runner is one of the few truck-based SUVs left, and although it is a bit rough, it’s also better for rough conditions. You can even still open the back window, just like the original 4Runners from 1984. This made it extremely easy to talk with people behind me while hooking up a tow rope to a rally car. Which one should you get? Whichever one fits your needs better. The 4Runner is rough and tough, no question. I wouldn’t want to drive one every day. Personally, if I needed a vehicle like this, I’d look for a third generation (1996-2002) 4Runner or an XJ Jeep Cherokee in decent condition rather than splurge for a new model. In fact, since I’m finding them for under $2,000 on Craigslist, they just jumped high on my list of potential winter beaters based on my experience with this new model.